In the mid 1990s India started construction on the Baglihar hydro-electric dam on the Chenab river. The dam is located in the disputed region of Kashmir. Kashmir is a region located in southwest part of Himalayan mountains northwest of India and northeast of Pakistan. Pakistan and India have both claimed Kashmir for themselves and thus the region has experienced of on-going conflict since both countries gained independence in 1947. There are multiple reasons why the region is so highly valued by Pakistan and India. First, there is the natural inclination of any nation state to want to expand its territory because of self-interest. Second, Kashmir has also become an issue of national pride in both states, especially in terms of religion for Pakistan. Third, Kashmir is located in the Indus River basin area, thus contributing to the flow of several rivers in South Asia. Negotiations were held but resulted in no resolution to the dispute over the dam; part of the deadlock is due to continued terrorism in India allegedly supported by Pakistan. “Under normal circumstances, India would have continued to fulfill its moral obligation of sharing its water with Pakistan. But unusual circumstances call for unusual action,” Jasjit Singh, former director of the Institute of Defence Studies and Analyses in New Delhi.2 In January of 2005 Pakistan, believing that India was speeding up construction of the dam, invoked article of IX of the Indus Water treaty which allowed for a neutral arbitrator to be appointed by the World Bank to resolve the conflict. Pakistan fears that India would use the Baglihar dam as a coercive tool by causing floods in Pakistan through release of dam waters. Already, decreased water flow has caused seawater intrusion up the delta where the Indus river meets the Arabian Sea; the salinization of hitherto freshwater has forced migration of peoples to urban areas and increased dependence on other sources of water. The loss of land to salinity build up is of agricultural concern but also general ecological concern. A report at Training Workshop on Wetlands, Biodiversity, and Water in Kushiro, Japan, confirmed that Pakistan had not only reached the limit of its water resources, but was also utilizing all cultivable land.7 The combination of these problems, according to the Workshop report, has led to flash floods and landslides that destroyed habitat and killed humans and animals. Again, further disruption to water flow would further exacerbate Pakistan’s precarious situation. The Water Poverty Index (WPI), as developed by Peter Lawrence, Jeremy Meigh, and Caroline Sullivan, provides a general tool which links household welfare with water availability and indicates the degree to which water scarcity impacts on human populations.8 In this index, countries’ positions are measured relative to each other in terms of 5 components: resources, access, capacity, use, and environment. Each of the five component indices is multiplied by 20 and added together for the final WPI score which ranges from 0-100. The resources category uses data regarding internal freshwater flow, external inflows, and population while the environment category uses data regarding water quality, water stress, regulation and management of environment, informational capacity, and biodiversity based on threatened species. Pakistan scored a 57.8 with its low scores being in the categories of resources (7.3) and environment (11.5). However, data shows that India is in an even worse position; this shows that Pakistan and India are both in very similar circumstances and each has as much stake in the construction of the Baglihar dam as the other. Agriculture- As stated earlier, Pakistan is highly dependent on agriculture, which in turn is dependent on water. The Kushiro Training Workshop report included an assessment of Pakistan’s agricultural situation. Of the 79.6 million hectares of land that makeup Pakistan, 20 million are available for agricultural. Of those 20 million hectares, 16 million are dependent on irrigation. Faruqui estimates that up to 90% of Pakistan’s agriculture is dependent on irrigation. An even more important fact is that many of Pakistan’s industries are agro-based, such as the textiles industry. Thus an interruption of water supply would have broad and ranging effects. When the country suffered a drought from 1998 to 2001, there were violent riots in Karachi. Energy- Obviously the energy aspect to construction of the Baglihar dam is of greatest concern to India. Intuitively one knows that has one of the world’s fastest growing economies, India’s energy needs are also growing rapidly. Currently the country is known for rolling blackouts and daily energy outages in some areas during certain seasons. It is worth noting though that it is estimated that half of Pakistan’s energy comes from hydroelectricity.10 India on the other hand only gets 6.3% of its energy from hydo-electricity.11 Data from a 2004 report from the Energy Information Administration (EIA) of the United States government on India shows that there is a burgeoning burden on India’s energy sector. 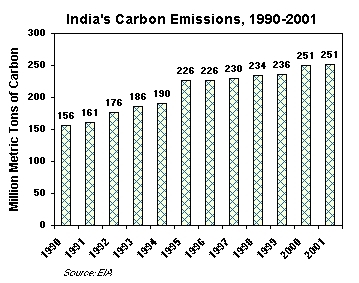 Since 1980 there has been a 208% increase in India’s energy consumption. 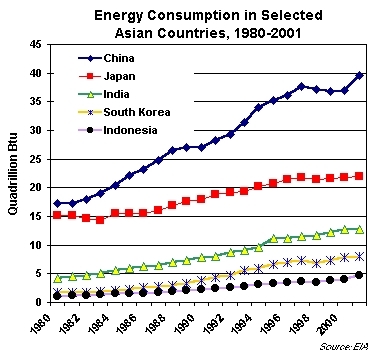 Even more alarming is that despite this growth and its massive population, it ranks below the US, Germany, and Japan in terms of consumption, indicating that its needs are not met. Thus, the Baglihar dam is a small but important part of India’s energy needs. The Baglihar dam would also be an important step towards environmental reform. Since 1990, only China has had more growth in carbon emissions than China. 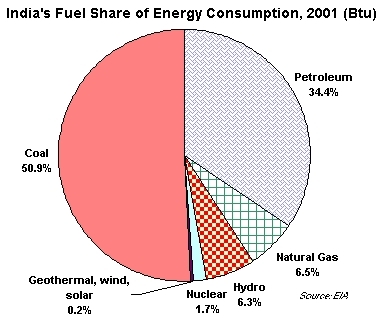 EIA data shows that 80% of India comes from coal and petroleum. Four of India’s cities- New Delhi, Mumbai, Chennai, and Kolkata- are among the world’s most polluted. South Asia is a region which has a diversity of habitats. In the northern mountainous region, an arctic climate prevails. Other parts of the sub continent are desert or semi arid to arid plains. The area of concern to this case study is a river basin, the Indus River Basin, and surronding plains. 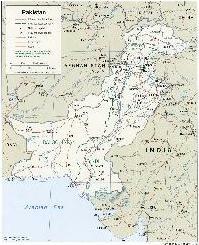 The dispute between Pakistan and India over the Baglihar dam is an interstate dispute. However, the current dispute is a continuation of the conflict between Pakistan and India over Kashmir and the Indus River basin; it is more complicated than a simple interstate dispute. Immediately after both states gained independence, they went to war from October 1947 until January 1949. The conflict was caused by an insurgency/revolt by tribesmen from Pakistan’s Northwest frontier province and Kashmiris against the Hindu ruler of Kashmir Hari Singh. According to Pradeep Barua 12 and many other scholars, this revolt and many subsequent revolts and insurgencies were supported by the Pakistani government to varying degrees. Desperate for help in 1948, Singh signed the infamous “Instrument of Accession” thereby handing his kingdom over to India. Indian troops entered Kashmir as did Pakistani military units in response to the accession. In April 1965 Pakistan launched a covert offensive into Kashmir which also turned into a war. Six years later there was another war, but this time away from Kashmir in then Pakistan controlled Bangladesh. Then in 1989, Kashmiris revolted against Indian authorities in response to an alleged fixed state election. Pakistan supported the revolt which was internationalized by the presence of so called jihadis/freedom fighters from across the Muslim world who were in the region to fight the Soviet Union in Afghanistan. When the Soviet Union ended operations in Afghanistan, these freedom fighters turned their attention to the Indian “occupation” of Kashmir. In the past decade, conflict has erupted twice. In May 1999 India launched air strikes on suspected Pakistani army units that had infiltrated Indian administered Kashmir. Both sides began shelling each other. In 2001, after two devastating terrorist attacks in Indian controlled Kashmir, both Pakistan and India elevated the alertness levels of their forces to the point that full blown conflict seemed imminent. However, after negotiations and international pressure, tensions were eased. Recent conflict has been especially dangerous because both India and Pakistan have acquired nuclear weapons. The two conflicts of the last decade also coincide with the time frame in which India began construction of the Baglihar dam. However, Pakistan has never explicated stated that the dam could become a cause for armed conflict. On the other hand, Pakistan has repeatedly stated that water is a prime national security interest. This claim is supported by research on water availability and the importance of agriculture to Pakistan (see environmental section). Currently the dispute has been referred to a neutral arbitrator from the World Bank so the Level of Conflict is Low. Given the history of past conflict between Pakistan and India, there must a note made of serious threat in this case and there has also been significant harm done to the environment in preparation for war. This is mainly due to the testing of nuclear weapons. In coding the dispute over the Baglihar dam and the overarching conflict over Indus River Basin, a question to be asked under the frameworks of current environmental conflict theory is whether it is truly a scarcity issue. On the surface, it seems that a scarcity of water and energy is to blame for the building of and controversy surrounding the Baglihar dam. However, in viewing the region as a whole it is clear that the conflict is one of surplus. Prior to the division of the Indian subcontinent into India and Pakistan, there was little dispute over water rights. The partition effectively divided what had been a unified water-sharing region. In a 1950 report in the Geographical Review, FJ Fowler concludes that “The boundary between India and Pakistan cuts across the hitherto unified Punjab irrigation network, giving rise to obvious difficulties” . Thus this conflict should be coded as a Direct Resource conflict. The interplay of various environmental factors are illustrated in the image below. Red arrows indicate a negative relationship (ie increasing stress or decreasing the affected variable); green arrows indicate a positive (increasing) relationship with an affected variable. The hexagons represent variables of strategic interest. Click on the thumbnail to view this causal diagram. The fact that both Pakistan and India possess nuclear weapons automatically catapults this dispute to the global level of strategic interest. The causal pathways (in the image below) leading to large scale war all have the potential for nuclear conflict which would have Armageddon like impacts on the world as a whole. Another added complication is that in building a dam upstream of Pakistan, India will possess the ability to flood or starve Pakistan at will. This ability was witnessed in July of 2004 when India, without warning, released water into the Chenab river, flooding large portions of Pakistan.5 The history of conflict between these two nations makes this possible use of nature as a weapon very real. In terms of energy, India also needs to factor in the importance of their proposed gas pipeline from Iran through Pakistan. Negotiations regarding the pipeline would certianly be affected by a negative outcome in this dispute. For more details, see the case study done about the Iran-India Gas Pipeline. One important factor that makes the prospects for conflict so grim is the fact that India insists on bi-lateral negotiations only. This allows it to exercise extra coercive force on Pakistan. However, in the case of the Baglihar dam, Pakistan has sought third party intervention, that of the WTO, to resolve the issue per the 1960 Indus Water treaty. Dr. Raymond Lafitte has been appointed by the WTO to act as a neutral arbitrator in the dispute. If India accepts his decision, conflict could be avoided. Here again one sees that the ultimate outcome depends on the decision of the WTO arbitrator and the acceptance of that decision. Since Pakistan originally sought WTO arbitration, the impetus is on India to accept this multi-lateral level of negotiation. Traditionally India has not allowed third party support/intervention in its relations with Pakistan. If India accepts the arbitrator’s decision, then victory does not become an option for it, as it will have already acceded to Pakistan’s preferred method of resolution. The arbitrator will mostly likely offer some sort of compromise. India’s rejection of the arbitrator’s decision then will lead to direct armed conflict. That will most probably result in a victory for India, but only after heavy losses, especially if the conflict becomes nuclear. To search for related cases, I searched on the keyword "dam." I organized the results in a table based on variables I had assigned this case. Each of those variables had a value assigned it; each case that resulted from the keyword search in the ICE database was analyzed in terms of these variables. If a variable was attributable to a case from the ICE search, then that case would be assigned the value for that variable. Cumulatively, those values made up the percentage a case was related to this case. The cases of the Ata-Turk Dam and Tigris Dam relate most directly to this case. Click here to see the table. From this search, the following cases were most related to my case. Most of these cases indicate that water disputes are occuring in areas with a real scarcity- namely the middle east. Areas where there is an abundance of water, like Canada and the US, do not seem to have any case studies regarding water rights, indicating that there are few source problems. Furthermore, it is shown through these results that dams are not the only thing that can cause water disputes. 9. Habib, Zaigham. (2000) Resource Conservation and Civil Society: Water and Food Security in Pakistan. In Peter Mollinga (Ed.) Water for Food and Rural Development (pg. 182-196). London, UK: Sage Publications. 12. Barua, Pradeep. The State at War in South Asia. Lincoln: University of Nebraska Press 2005.